I was born at precisely the right age to throw myself into Star Wars. I became fixated on the Force in the most profound way. But, as George Lucas regularly tries to remind his fans, the celebration of Star Wars is distinctly rose tinted. Of course, Star Wars was popular when it was first released. But it wasn't the sudden, galaxy shattering event we like to remember. It was a good kids' movie that everyone could enjoy; the revolution came much later. In fact, I'd argue Star Wars didn't really happen until The Empire Strikes Back. And for me personally, it wasn't even the sequel that cemented the Jedi mythology in my consciousness. It was the licensing; the merchandising phenomenon that actually paid for the next two movies and recouped the costs of the original. That's what really spread the Skywalker name across cinematic history and drew me toward the Dark side of Star Wars obsession at such a vulnerable age. Naturally, I collected all the toys. Any kids shuffling around the gutters at the latter end of the 1970s were obliged to have at least a couple of grubby, well-worn Star Wars figures stuffed in their marble bag. It was schoolyard law. And the Millennium Falcon play set was the only Christmas toy available for a couple of years, so you either switched onto Star Wars or went without festive reward. Even though we obsessively gathered up the collectables, they were only a small part of the rising storm cloud of viral licensing. It was this facet of the Star Wars universe that really grabbed my attention. Being a whippersnapper with a pretend lightsaber, I had no concept of licensing and merchandising - all I could see was Star Wars on every breakfast cereal, t-shirt and toothbrush. 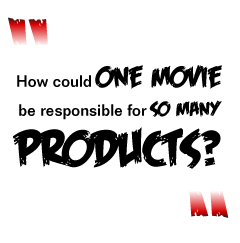 How could one movie be responsible for so many products? It was genuinely overwhelming. The movie and the toys were only the tip of the iceberg. The real empire was on supermarket shelves, in corner shops and magazines - there was only one movie, only a couple of hundred toys at the most. Sure, these collections were perfectly understandable, but they were just for the plebs and droids. A real Star Wars collection went beyond these playthings, deep into the uncharted realm of extreme superficiality of Star Wars branded consumer products. I knew I had to have it all. My methods were simple. I simply waited until my parents went shopping, then raided the cupboards and salvaged the valuable Star Wars packaging before they had the chance to ruin my precious ephemera to get at the worthless goods inside. A proper Star Wars collection was coming to me. George Lucas obviously wanted me to keep all this stuff, or he wouldn't be sending it directly to my house.